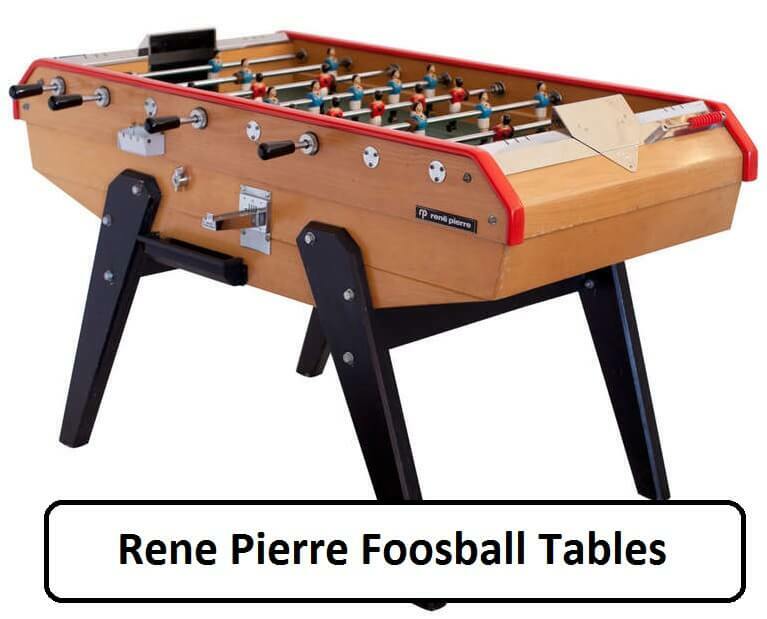 Rene Pierre Foosball Table - Find Their Models and Reviews Here! Today we are going to present you, which are best Rene Pierre foosball tables, but first, let’s look at the history of this great brand. Rene Pierre is a French manufacturer of Foosball Tables and Pool Tables. His series of foosball table production is centered on tournament standard and home use. 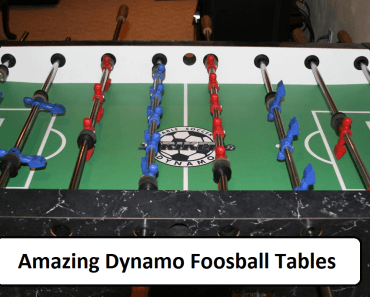 His styles of foosball tables are based on the European style of play which is; ball control, pin shots and finesse, in comparison to the American style of playing which is power and speed. Rene Pierre makes high-end foosball tables, even the tables for home play is made with the highest quality material; no substandard tables are ever turned out of Mr. Pierre’s manufacturing company. All his foosball tables can be played with both the confidence of professional and first-time players. Here I have listed some of the best foosball tables of Rene Pierre and made reviews of them. Take a look at them, so you know better about their features. Rene Pierre Champion Foosball table costs quite a bit of $. 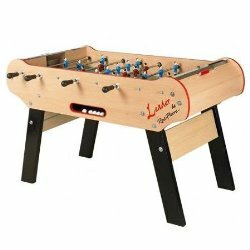 Manufactured with the best and highest quality material; the cabinet is of Medium Density Fiberboard or MDF which is 3/4inch thick, with sloped corners for ball control and reliable ball return, and weighs 200 pounds, the playing men are made from die-cast metal and are hand painted for long-term use. The Rods are of Chrome Plated Steel and fitted with ergonomically round handles for precision control and comfortable play; which are a unique feature of the René Pierre brand. Legs are so designed at an angle for balance and stability during play, and the scoring units are Abacus sliding affixed at both ends. No truer foosball table you will find but this Rene Pierre Competition Foosball Table, which was fashioned from the original model made in the 1970s and believed to be a standard to be revisited, hence the Competition Foosball table. The table is in a world class classification and is of the best quality material. The Cabinet is made from Beechwood as well as the legs and they are angled for stability and balance during play. The field is made of Linoleum for easy ball play with players that are of die-cast aluminum and hand painted, the complement of a single man goalie. Constructed with chrome plated telescopic Rods, and rounded handles, which allows for smooth play and built to last for years. The 10-year Warranty is enough to let you know the confidence placed in the quality of this foosball table. 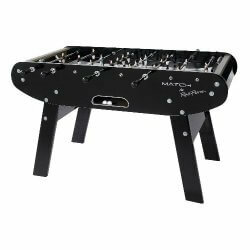 This Rene Pierre Competition Foosball Table costs quite a bit of $ on Amazon and there may also be available a Free Shipping. This series of Rene Pierre Foosball Tables come in two colors; the Rene Pierre White Match Foosball Table and the Rene Pierre Black Match Foosball Table. The Rene Pierre White Match foosball table costs around 1000$ and there may also be available Free Shipping when purchased on Amazon. 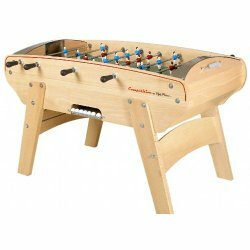 This foosball table is a prime gift for any family or even for gifting yourself. The quality table in the Rene Pierre White Match Foosball Table is very high and you will certainly not be disappointed. The cabinet is built with solid wood and also the angled legs. Their angle is so designed for maximum stability during rough play and the playing field is made from Linoleum for smooth returns during play. Hand-painted playing men made from Die-Casted Aluminum, affixed to Chromed Stainless Steel Rods Ergonomically balanced with Teflon Sleeves for repositioning the players for smooth play and scoring. This foosball table comes almost fully assembled, so you have little work to do before playing. The Rene Pierre Foosball table weighs 145 pounds and is a great addition to any home for recreation and fun. The Rene Pierre Black Match Foosball Table has two brand foosball tables of this name. Both tables even though they are different costs, are similar to the Rene Pierre White Match Foosball Table. Quality and manufacturers material which makes these three tables are high-end and made to last. You will not be disappointed with any purchase. The only choice is whether to buy a black or white foosball table made by Rene Pierre. Manufacturing of this French Foosball tables is done with the highest quality materials. The cabinets are made of MDF or Modern Density Fiberboard which is quite durable and is able to withstand any rough a fast play. The board is, at least, 3/4inch thick and the playing field is made from high-grade Linoleum which is a flexible and smooth surface to manage the rough play of this game. The cabinet is also as some analysts have categorized it to be; an egg-shaped. This unique shape allows the ball to not jump out during play and for good ball control. The players on this foosball table are all hand painted and are mounted on Chrome Plated Steel Telescopic Rods. These rods are specifically designed and placed on the table so as to not injure players during play. This is because they are so positioned to not protrude on the other side during play so it is safe for children to be around while having a very spirited match. Well counterbalanced for precise play and great space when legs are lifted for the ball to pass through and for shooting. The legs are also made from MDF material and are positioned in an angled position for stability and to enhance strength during play. They are not made with leg levelers, so a solid, level surface is needed for this table. 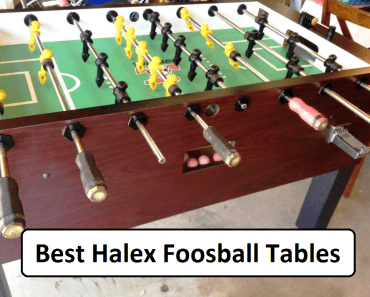 Dead spots are noticed during play, as stated by some foosball players whenever the table is not positioned on a level surface, so be advised to find a level surface for your Rene Pierre Foosball Table. 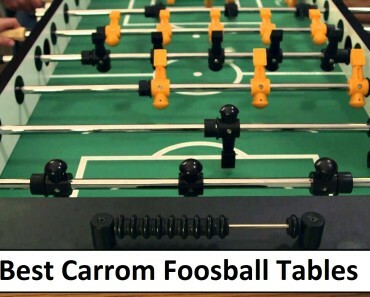 The French play a more controlled style of foosball, so this table comes with cork balls instead of the solid balls that the American tables are sold with. The cork balls allow players to experience a slower play and more precise control of the ball. 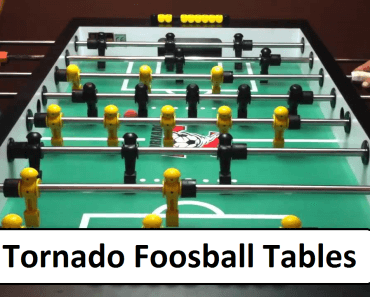 This is relatively easy as this table is sought by experienced and more avid foosball players, worldwide. The elegance of this Rene Pierre Foosball Table will not be lost on you, even after the price you pay for owning one. 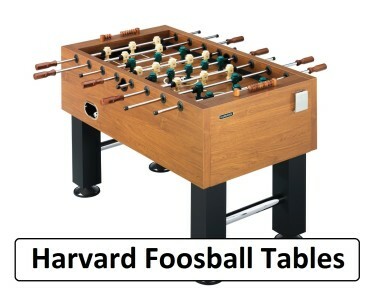 Their table is not cheap, so you are maybe also looking for Rene Pierre foosball table for sale. On Amazon they sometimes have some good deals, so we recommend you take a look there. 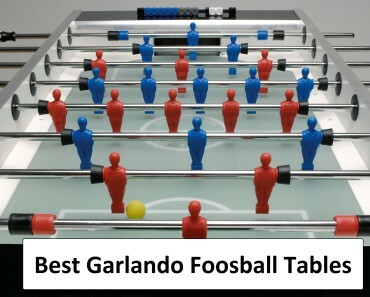 You have now seen some of best Rene Pierre foosball table models and we hope you have found your favorite model. What comes next is that you take action and order one or more for you.